Wine, cheese and chocolate tasting bar hits all the right marks. 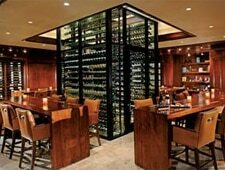 : Much more than just a wine bar, ENO features fine wines, artisanal cheeses and decadent chocolates in a casually sophisticated space just off the lobby at The Ritz-Carlton, Laguna Niguel. There’s nothing in OC quite like ENO as a sommelier greets you and leads you to a nicely designed backlit communal wood table with a view of the floor-to-ceiling glassed-in wine tower. After understanding your tastes, the sommelier brings out a flight of three wines from the impressive 700-bottle list. Next, a professional cheesemonger pairs a cheese, charcuterie or chocolate platter (or all three) to match your wines. The cheesemonger creates smart pairings using not only hard-to-find international cheese and charcuterie selections, but also classic accoutrements such as roasted Marcona almonds, quince paste, cornichons and toast points. A visit to ENO can be a meal unto itself, or a good way to start or end a fine dining extravaganza.